Put It On The List: What a Cool Birthday Gift! Those who know me well know that I was married on my birthday, so I celebrate my birthaversary each year. Or whatever you want to call it. This year, for our 20th anniversary, hubby and I celebrated by going to Hawaii. I had wanted to go to Europe, but our friends were headed to Maui and offered us a room in the house they were renting. With arm-twisting like that, who were we to say no? Since that was a couple of months early, I kind of wondered if we might have some sort of smaller local celebration. As the time approached, nothing really presented itself. No big deal, really. I'm not the kind of girl to kick and scream. I mentally shrugged and went on about my business. On Saturday night, we went to see one of my all-time favorite songwriters, Terry Taylor. 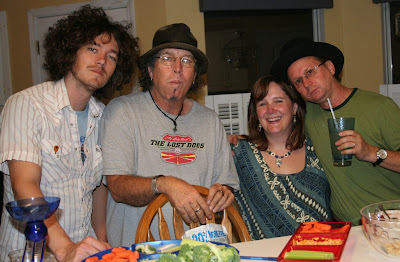 Terry is the front man for Daniel Amos, a Christian alternative band, and the Swirling Eddies, a humorous offshoot. He also plays with the Lost Dogs, a band comprised of front men from other bands. On his current tour, Terry is playing with his son Andrew for the first time, which is fun to see. He's also being accompanied by Steve Hindalong, a recent addition to the Lost Dogs and drummer and songwriter for The Choir, another band I've followed for more years than I care to count. You, dear reader, would know Steve best for his songwriting credits... perhaps not my favorite ("Beautiful Scandalous Night") but probably his most famous ("God of Wonders"). Saturday's show was fun: great musicianship, to be sure, but also wonderful comraderie between three men who clearly were having a genuinely good time playing music together. I had my camera with me, but the pictures were abysmal, so I shall not burden you with them. Cut to Sunday. I get an email from my friend Angela, forwarded from Terry's manager. Seems there has been a cancellation, and they'd like to schedule a house concert anywhere between San Antonio and Dallas on Monday night. Angela is an apartment dweller, but my house is perfect for such a thing. Angela's birthday is Sunday, and she knows mine is Tuesday. We're both huge fans; what a great gift to both of us! I book the show, knowing I have about 30 hours to pull together a crowd for it. I invite everyone I know on Facebook who lives in Austin, regardless of whether they might have heard of Terry. One of the people I invite is the sister-in-law of the promoter from the Saturday show. She gets him involved, and he adds another hundred people to the invite. Suddenly, we're talking about a potential real crowd here! Forty people come to the show. 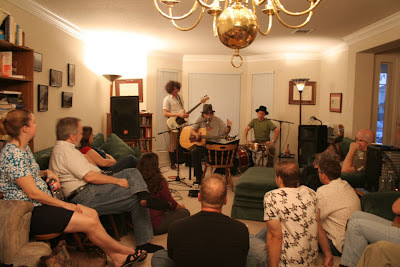 Andrew (Terry's son) tells hubby it's the second biggest crowd they've seen at a house concert. He's impressed we've managed to publicize this well given a little over 24 hours for a Monday night show. So am I. The crowd is appreciative. Many know all the songs; a few aren't familiar with Terry but come because of friends or because of other reasons. We don't charge admission, but the tip jar fills nicely, and the band sells some merchandise. Most of the pictures don't turn out, but a few do, so I'll share those. First up: a shot of the band from the back of the room, showing part of the crowd. I counted about forty people, including kids. Not bad. 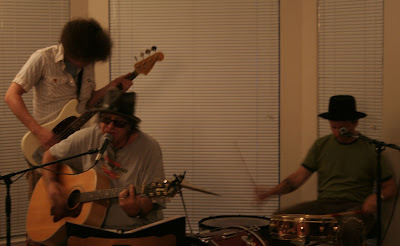 The guys jamming. From L-R, Andrew Taylor, Terry Taylor, Steve Hindalong. During one song, Steve shows off his lasso skills: risky business in Texas. It's the only time I use a flash during the show. After the show, hubby insisted I get a pic with the band. From L-R, it's Andrew Taylor, Terry Taylor, me, and Steve Hindalong. It's not often you get to spend an evening with people you've admired for so long. The talent and poetry that flows through these gentlemen is hard to describe to the uninitiated. I asked them each to sign something that would be meaningful to me. Terry signed my copy of the first Daniel Amos CD that I fell in love with. It's from the '80s, and I can't say it's aged best of all his music, but I still love it. Steve signed the first recording of "Beautiful Scandalous Night." He wrote, "On the hillside you will be delivered," which is a lyric from the song. What did Terry, ever the jokester, write on the Daniel Amos CD? "Don't listen to this." These guys were so real and vulnerable. It's in my top 5 concerts of all time. Alas, I didn't have anything of Andrew's for him to sign. I'm not sure his band (loud punk or somesuch) has recorded albums. You know, that's a huge compliment coming from you. Good stuff. No, Andrew's band doesn't have a CD yet (they recorded one, but they aren't happy with it). I just figured maybe you found something else for him to sign- an empty CD case, something he drank out of, his bass as a birthday present (we wantsss it my precioussss! ), a body part, whatever. He was as cool to talk with as Terry and Steve. He was definitely cool to talk with; I enjoyed him a lot. I chatted with him both Saturday and Monday. Since I didn't have any CDs or anything he's written, it really didn't occur to me to have him sign anything. I guess maybe it should have. I didn't ask either of the others in front of him... although Terry and I did talk about how he signed my arm cast at Cornerstone the year I broke it (he wrote "Break a leg," of course, which amused both him and Andrew). I'm so glad you had an awesome birthaversary! It was fun to see the band in the living room again. Happy Birthaversary!!! Sounds like a great time was had by all, and of course, totally up your alley to do something like this!! Congrats on 20 years!!!! I'm an empty-nest mom of two, married to the perfect man for me. With degrees in psychology and electrical engineering, I started an event planning business in 2012.